Heavy Duty Galvanised Corner Shelving Unit 1800mm H x 900mm / 698mm W x 400mm D 175KG UDL. Heavy Duty 5 Tier Galvanised Shelving Unit 1800mm H x 900mm W x 400mm D 175KG UDL. This fantastic shelving unit is ideal for the garage, home storage or workshop. If you are looking for a professional product this is the range for you. With smooth 5.5mm MDF shelves, which can hold a load capacity of 175kg UDL and with 5 levels they are ideal for all storage needs. An Amazing 175kg UDL per shelf. Each shelf is a Smooth 5.5mm MDF sheet which is stronger than chipboard. Made from 0.8mm thick Galvanised Steel. Zinc coated and Corrosion Resistant. Adjustable shelf height every 35mm. Tested & certified to EU & International Manufacture & safety standards. Boltless easy to assembly, tap together with a rubber mallet. Assembled dimensions CUG002 1800mm H x 900mm/6890mm W x 400mm D. Assembled dimensions GAL002 1800mm H x 900mm W x 400mm D. UDL - Uniformly Distributed Load. Any product you return must be in the same condition you received it and in the original packaging. Heavy Duty 5 Tier Galvanised Shelving Unit 1800mm H x 900mm W x 400mm D 175KG UDL Product Information: This fantastic shelving unit is ideal for the garage, home storage or workshop. Galvanised Shelving 5Tier Garage Unit Storage Racking Heavy Duty Shelves 175kg. 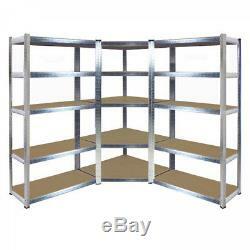 Shelf surface 895mm W x 395mm D. Assembled dimensions 1800mm H x 900mm W x 400mm D. Box Dimensions 920mm L x 410mm W x 70mm D. The item "Galvanised Corner Shelving Garage Unit Storage Racking Heavy Duty Shelves 175kg" is in sale since Monday, November 5, 2018. This item is in the category "Home, Furniture & DIY\Storage Solutions\Storage Units".